Fees associated with filing trademark applications in Kazakhstan as well as other trademark fees are available in the fee calculator. 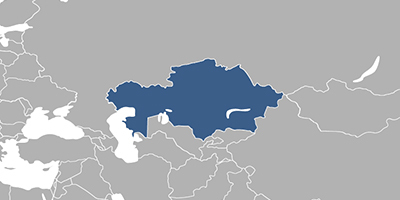 Multiple-class trademark applications are possible in Kazakhstan. The Power of Attorney may be provided simultaneously with filing or within three months from the filing of the trademark application in Kazakhstan. The priority document must be provided within two months from the filing of the trademark application in Kazakhstan. If the priority document is not in Kazakh or Russian, the certified translation thereof must accompany the document. Opposition period in not stipulated for the trademark applications in Kazakhstan. The official fees for registration and publication should be paid within three months from the date of receiving the decision to register the trademark. A trademark in Kazakhstan is valid for ten years from the filing date of the application. It may be renewed an unlimited number of times for ten-year periods within one year before expiration of the validity term. It may also be renewed within six months after the renewal due date provided that a surcharge is paid. Reinstatement of a lapsed trademark after said six-month period is not possible. Any interested person may file an opposition against registered trademark in Kazakhstan if this trademark has not been used within any three consecutive years after registration. It is necessary for the foreigners to perform the trademark prosecution in Kazakhstan through an agent, a registered Kazakhstani trademark attorney. Figurative, verbal, literal, numerical, 3-dimensional and other elements which allow distinguishing between similar goods and services may be registered as a trademark in Kazakhstan. Online Search databases: Kazakhstani Trademarks, International Trademarks.